← Brownhills Memorial Hall: Quiz night and supper this Saturday! 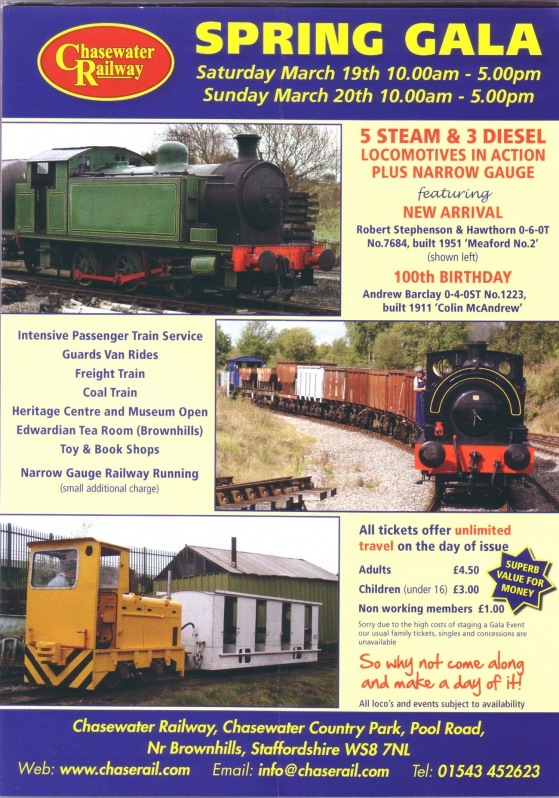 Chasewater Railway Spring Gala – This Weekend! Click image for a readable version... see you there! The coming weekend (18-19th March 2011) sees the return of the Chasewater Railway Steam Gala. This well-supported, fun family event is a cracking day out for all. The little ones will love the steam trains – the sight of Thomas’s real-life relatives is sure to enthrall. For the older members of the family, there are diesels, narrow gauge, the museum, and don’t forget the tearooms. There will be plenty of old hands about to chat to, too, so nostalgia and local history will not be in short supply. An increased frequency timetable will run, so everyone will get a good seat. Chasewater Railway is the hidden gem in the local area. Many are surprised when they first find it – if you haven’t heard of it before, this is a great weekend to check out this welcoming, passionate society and their fascinating, lovingly preserved line. Please check out The Chasewater Railway Site for details. This entry was posted in Brownhills stuff, Chasewater, Events, Followups, Fun stuff to see and do, Local Blogs, Local History, Local media, Shared media, Shared memories, Social Media, Spotted whilst browsing the web, Walsall community and tagged Chasewater Railway, colliery line, diesel trains, fun days out, local events, preserved trains, Spring Gala, Steam trains. Bookmark the permalink. 1 Response to Chasewater Railway Spring Gala – This Weekend! Thanks for this Bob. If you were there, I missed you this time!! !